Want to get paid to travel? Find out about two dozen more websites that pay for freelance travel writing! 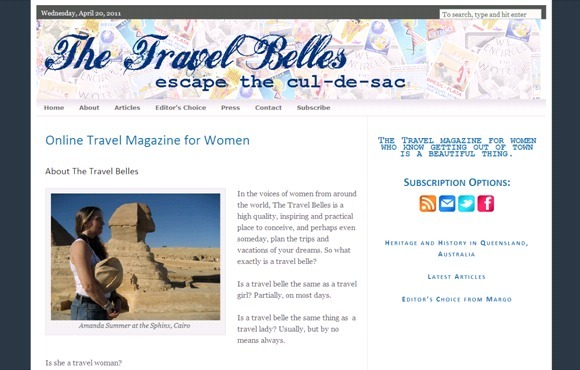 The Travel Belles describes itself as the travel magazine “for women who know getting out of town is a beautiful thing.” Indeed, that’s the one thing the magazine says all its readers have in common–no matter their age or where they might be in the world, they love picking up their passport and seeing new places. Encouraging women to “escape the cul-de-sac,” The Travel Belles offers insightful, inspiring travel narratives all about seeking out beautiful adventures, whether in our backyard or beyond. This week, The Lost Girls spoke with The Travel Belles’ publisher and editor, Margo Millure, about what goes into a winning pitch for the website. Read on to find out how you, too, could write for the magazine. 1. What sections are open to freelancers for pitching? All sections listed on The Travel Belles homepage are open to freelancers. No surprise – “Belles on Location” is our most popular section for submissions, since we are a travel magazine, and of course writers who write about travel are most interested in writing about the places that they have visited and loved. These pieces can be a traditional destination-related piece or a personal narrative. By design our sections cover just about everything from food, books, movies, history, and style as they relate to “travel.” Because of my own ambiguous feelings about magazine “sections” and “pitching,” I like to encourage writers who aren’t sure where their writing might fit in, not to worry about it. Just pitch or send a spec piece of the story you want to tell that you can see fitting with the site. If I love it, I’ll squeeze it in! 2. Is there a particular format and style you prefer when it comes to freelance work? Are you more interested in narrative pieces, “list” articles, guides, etc? I lean towards the personal essay or narrative style of writing, but the kind that transcends navel gazing in some way. I am a firm believer that you can write in the first person, using “I” a thousand times, without it being all about the writer, as long as they are always remembering the reader. All pieces do not have to have a big “epiphany,” but I want to be swept away somewhere, familiar to me or not, in a new way. “List” articles and less personal forms are also needed and welcome; but still having a strong angle, point of view and compelling writing style is desired. Big bonus points if you make me want to run and pack my suitcase! Even more bonus points if you can make me laugh after a long day! 3. What makes a stellar pitch for The Travel Belles? Can you give examples of pitches that were outstanding, including links to the final stories? First and foremost, writers should remember that since they are selling themselves as a writer, the email is the handshake, the first impression. Since they are writers, they should be sure to make it good. Here are a few things the best story pitches have going for them: 1) They give a good enough idea of a writer’s style and attitude that I feel confident counting on them to deliver. 2) They give 1 -5 brief story ideas. 3) There is adequate detail and a clear angle. 4) A couple of links to their work on the internet or a writing sample. 5) Indication that they have taken a good look at The Travel Belles. Psssst…. there is never a better time than in the email to tell me what they may have seen on the site that they liked or related to. If sincere, flattery and enthusiasm at this stage will get you everywhere! I don’t hire writers for their expertise as much as I do for their voice and respect for what they alone can bring to the reader. I encourage them to submit pieces on spec, or simply write a letter introducing themselves. Besides making me laugh or want to pack my suitcase, there is nothing that makes me happier than a great finished piece of writing someone has taken the care to create with The Travel Belles in mind. The non-good pitches all have one thing in common: They make my life more difficult. No matter where a writer is pitching, a good thing to ask his or herself is, “how can I make this editor’s life easier?” Quite simply, this is always the fastest way to being published anywhere. 5. Similarly, what are the most common mistakes made by freelancers when pitching? By far the most common mistake made by freelancers is making it clear that they haven’t looked carefully enough at the site to tell whether or not we’re a marriage made in heaven! 6. If you’ve got a stellar idea, which editor should you send it to? Can you provide the names and email addresses of the right people to connect with? 7. Finally, What sets The Travel Belles apart from other travel websites? A reader of The Travel Belles is generally female, and a little older than the readership of other travel websites. That said, I see our content as being inviting to women of all ages who share a common sensibility or outlook on life, or perhaps share a life stage or interest. As a longtime traveler and internet user, when I went to the search engines to find the kind of travel information and inspiration I was looking for, the results were piecemeal. So what I did was set out to make what I enjoy and appreciate in travel and travel writing available in one place. In addition to continuing to provide great content, in the coming months we will be introducing Travel Belle Trips, for small group travel to various locations. Margo also took the time to put a video together exclusively for Lost Girls readers about how exactly The Travel Belles came about. If you want to know more about the inspiration and philosophy behind the magazine, take a look! Naipaul’s book titles are the only redeemable quality about the man. Otherwise, he is a horrific human being who has inflicted a lot of damage on those he allegedly loved, including his cancer-ridden wife who he drove to suicide with his affairs. I also found his views to be not just dimwitted, but rather frighteningly jaded by his allegiance to ultra right wing fundamental Hindu organizations like Shiv Sena. I’ll save that for another post though, haha.